Are you a compassionate, generous acupuncturist or a student intern at an accredited college? Do you want to spend a rewarding and meaningful one to two weeks in Africa or Mexico? Would you like to teach others how to use acupuncture to relieve pain and suffering? We want to hear from you! The training methods used by the Project involve didactic learning and close supervision. Teams of four to six travel each time and always include an experienced Trainer. Trainings often include visiting the Trainees' clinics, which serves as an excellent opportunity for you to learn about healthcare in Africa or Mexico. 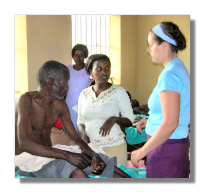 Additional time can be spent in Uganda to practice in a village clinic. All applicants are screened to ensure good fit and skills. If you are accepted, we will provide as much help and training as you need for you to feel comfortable with the Project's material and teaching methods. Trainers are responsible for raising funds to cover the cost of their airfare to the host country plus the program fee, which covers the cost of in-country lodging, travel, breakfast and lunch and a portion of the training cost. 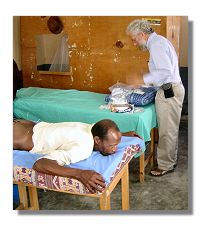 For details about the fees, please contact the home office (info@globalacupuncture.org). Participation in activities before or following scheduled work in the host country will incur additional costs. GAP will provide informational materials about the project and consultation to help make sure your fundraising efforts are successful. Although at first the fund raising may seem daunting, the value of the experience is priceless. If you are interested, please first read the Position Description. To apply online, click here. To download the Trainer Application and send it to us by post or email, click here. Please do not hesitate to contact us if you have any questions or concerns. We look forward to hearing from you!